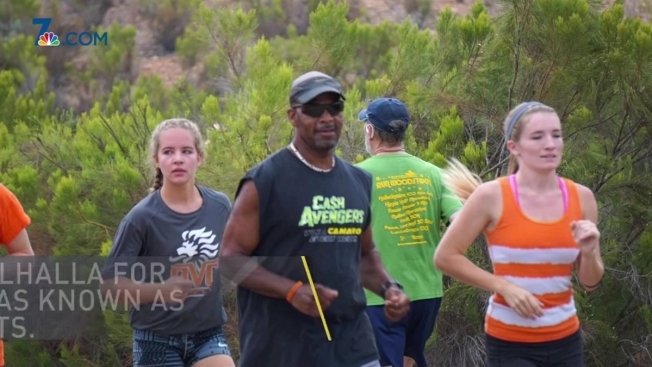 Students gathered Wednesday to mourn the loss of their beloved cross country coach, Carter Yarborough, 48. He died Sunday morning when his motorcycle collided with a deputy patrol vehicle on South Coach Highway in Encinitas. The deputy driving the patrol car was not injured. He immediately administered CPR on Yarborough after the crash but was unable to save his life. “He really comforted us and made us excited to be out here," said Ariana Martinez, 17, who was looking forward to seeing Yarborough over the summer for training. She added she is shocked he won’t be there mentoring her for her senior year of high school. Yarborough, affectionately called ‘Coach Carter’ by students, coached at Valhalla High School in El Cajon for more than 15 years. "He really treated us like a father for everyone," said Martinez. On Wednesday, 16 students gathered on the high school campus in their orange cross country jerseys to pay their respects. The teammates plan to hold a run in Coach Carter’s honor on Friday called the 'Memorial Mile.' It will take place at 6:30 p.m. on the school track. Anyone in the community is welcome to attend.